Booking your own holiday is a lot cheaper than booking through a travel agent. However, doing all the research needed to plan your own trip can be extremely time-consuming. With the support of the holiday script, you will save time as well as money, and you will visit beautiful places. 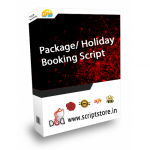 Package Holiday Booking Clone Script is the easiest, Fastest and secure Php Based script for Holiday Booking. Download this Package Holiday Booking Clone Php Script and start your own website.